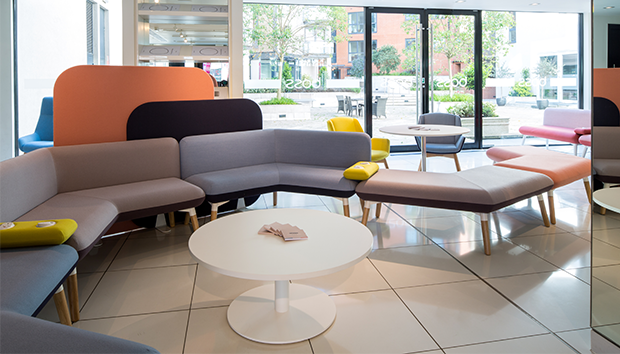 With the increasing need for furniture to be flexible, Myriad allows you to create a comfortable meeting area, private huddle space or a stunning island. Myriad by Boss Design Group is a diverse selection of upholstered modular furniture, completely flexible and reconfigurable. The range is made up of eleven linkable seating units, three privacy screens, side tables and arms that accommodate power. 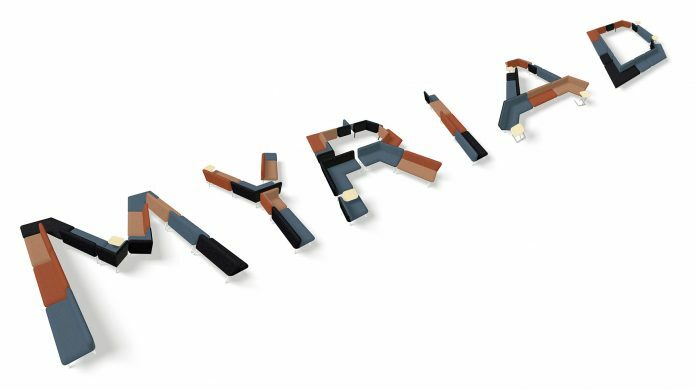 According to Boss, the idea behind Myriad is that you become the designer, arranging modules to create any shape you desire. Modules come in ‘L’-shape and 120° internal and external shapes allowing the creation of ‘Huddles’, ‘Islands’ and ‘Chains’. Modules can be mixed, linked and easily moved around, offering numerous possibilities for collaborative work spaces. Link arms can include 1 or 2 Office Electric’s Pixel power/USB modules. You can start configuring straight away as Boss have created a funky new website specifically for Myriad, here. 100% Design is now on and Boss Design will be launching a series of new products. First up is Marnie, described as a contemporary and luxurious lounge chair collection. The understated design features a fusion of elegance, premium upholstery and attention to detail, embodying luxury and style. The award winning Coza chair will also make its début. Coza boasts extraordinary comfort and dynamic support by using the natural flexibility of a single ribbon of material. Unlike other task chairs, it does not require multiple components or complex assembly. Finally, Boss will unveil a new standalone media wall to extend its eminent soft office collection. This new media wall boasts the latest in technology, comfort and ergonomics, and is designed to effectively break up large, open plan spaces with exceptional seating and technology combined into one striking place. It is ideally suited for team meetings and collaborative tasks.